Many of my peers, juniors and some seniors often ask me: on the purposes that each person ought to be having. Sometimes people feel purpose-less, often there are no assignments - so people feel out-of-place or insecure, or there seem to be irrelevant assignments to be executed or there are assignments which need to be done, but your heart does not belong to it! So what is the way out? Well there is an antidote - life is not just about doing the allotted assignments: life is actually something else: it is about PREPARATION! Life is about practicing, verily, PREPARATION MEETS OPPORTUNITY. This is in fact, the best theme for life. Just imagine the life of a committed Hindustani music singer: do you think her life is only about flitting from one music program to another program? Do you think there are no dry days - when concert opportunities are not there?! A singer has her major focus on the early morning riyaz: practice session. It is this preparation time, which gets the maximum focus in her life. The singer focuses on the riyaz or practice session, which is responsible for her concert performances! So it is preparation-focus, which ought to be every professional's obsession! And then doing the job with aplomb when opportunity comes by!! To start a preparation-focused professional life, begin with understanding your professional profile. For instance, as a medical representative - your profile will want certain competencies: territory knowledge (doctor and pharmacist profiles, ideal meeting timings, product prescribing behaviors, pharmacist OTC and substitution behaviour, short and quick work routes in the territory)..., detailing skills, basic product profile knowledge, competitor product and activity knowledge, and relationship management knowledge (eg., knowing how to communicate, build rapport, greet people on special occasions like their birthday, submitting greetings on festive occasions - Eid Mubarak to Muslims at end of Ramadan period etc). If you are a trainer or product manager, understand the product management concepts and training aspects. Focus on preparing for the deliverables. A lecturer is not a lecturer until he can give proper lectures! After understanding the profile requirements and parameters, develop your competencies on those lines continuously!! That is preparation-focused behaviour. If you are regular to the fitness center or gym, while going through the exercise and fitness equipment routine, you will realise that there is no end to the no. and types of exercises you can perform. It can go on and on and on, until you can take it or you have the time and aptitude for it all... same way, there is no end to the depths of knowledge you are trying to master in your professional sphere! The knowledge and activity stream for preparation is bubbling, continuous and endless! So preparation is also an endless exercise, with several milestones in the journey for you to keep reaching!! The biggest room in the world is the room for improvement!! And therein lies endless opportunity. Your professional profile is not static! The mobile phone, whatsapp, facebook, social media, email, ebooks, internet, blogs, biotechnology, rDNA technology, MAB (monoclonal antibody) business ... these were all simply not there in 1992, when I started my work-life after M Pharma... Now these software and social media tools are great for communicating knowledge, motivating and keeping a tab on things. We routinely use social media whatsapp for updating marketing campaign work with each other!! This creates a ripple effect and work dynamism. Change is the only constant of life!! So how can the professional profile be static? Preparation attitude is a continuous process. Today, training is not about providing knowledge... there is endless information, data, knowledge and insights available in the information superhighway! The moot point is can you wade through it, get what you want, grasp the essentials, and put it across in an easily assimilable manner!? Can we engage trainees with the learning and get them excited enough to learn and apply it/practice it!? Are there interesting ways, using modern technology (web-based, mobile-based or social media based methods) to deliver learning experiences? If yes, as a trainer, one has to grasp these new ways!! The same chalk and blackboard method or reading from an attractive powerpoint is not enough! So that makes a professional trainer's life one of continuous preparation! Today, that is the need from a trainer! The challenge for a trainer is to help learners acquire the necessary knowledge units, skill sets, and get them motivated enough to use it in day-to-day working. It is one thing to handle the visual aid in the training spot, however, the fact is: at doctor clinics' - visual aids are not even opened, if they are, then the visual aid page is flashed for a brief moment - brand name is mentioned, pointer is not used... pay-off sentence is not emphasised... the real challenge is getting learners to learn and apply! Take for instance, in 1992, B lymphocytes were mainly in HUP (human physiology) subject. We learnt that B lymphocytes were a type of agranular leucocytes that produced antibodies which help destroy antigens (foreign bodies) in the blood stream. But today!? B lymphocytes are billion dollar business!! B lymphocytes are used to produce required target antibodies, which have therapeutic, diagnostic and academic uses. IV (intravenous) infusion: Trastuzumab (humanized mouse based whole antibody) is used for treatment of HER 2 positive breast cancer cases. Various other antibodies are marketed chiefly for treatment of autoimmune diseases, infections and cancer. Antibodies are no more natural biomolecules produced as a part of passive or active immunity by B lymphocytes in the body! B lymphocytes are vital economic entities: producers of antibody protein molecules that have billlions of dollars in sales!! Genentech (now a member of Roche group) invented trastuzumab (an antibody: specifically a monoclonal antibody). Their brand name for this whole antibody IV infusion preparation was HERCEPTIN. In 1998, the sales of this molecule was 30.50 million USD. In 2008 annual sales had progressed to 1.38 billion USD (1,382 million USD) - this - only in US market! 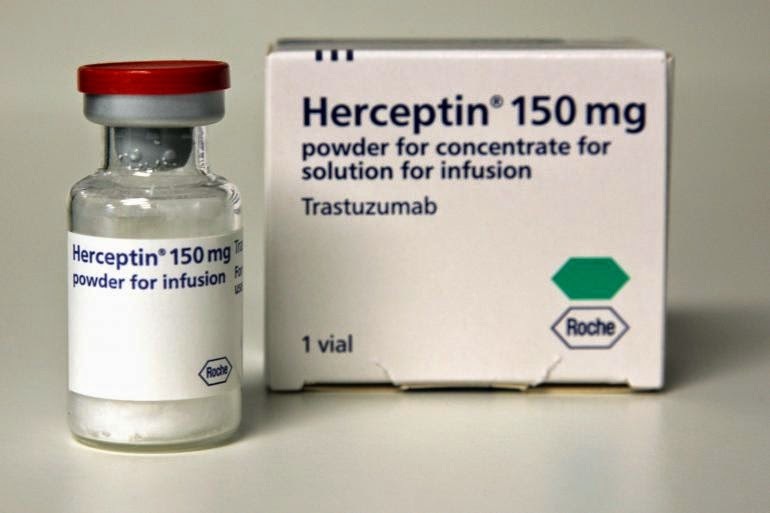 In the world market (including US market), Herceptin sales was 1.82 billion USD approx. in 2008. 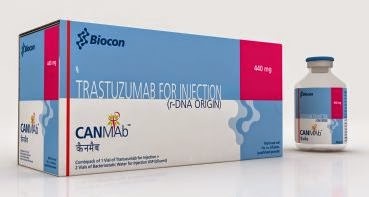 As per Fierce Pharma (www.fiercepharma.com) Herceptin had estimated worldwide sales in 2012 of 6.08 billion USD. The product patent for trastuzumab (Herceptin) expired in 2014 for Europe, and in USA, it will expire in 2018. In the same report from Fierce Pharma, we observe that Herceptin is ranked no. 8 pharmaceutical product in the world, by sales value in 2012. Product patent expiry has opened up a market for biosimilar Trastuzumab brands. 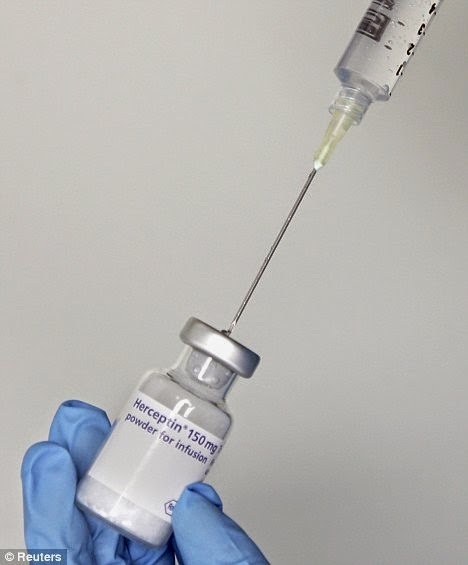 The me-too antibody preparations are called biosimilars. Bangalore based Biocon has launched its me-too biosimilar antibody trastuzumab under brand name: CANMAb. International generic major Mylan has the brand Hertraz: trastuzumab biosimilar. CDSCO (Central Drugs Standard Control Organization: www.cdsco.nic.in) has issued a pdf document in their website: GUIDELINES FOR SIMILAR BIOLOGICS: Regulatory Requirements for Marketing Authorization in India. This is a very good document that provides an insight into the challenging and enigmatic world of similar biologics and thus makes biosimilars or similar biologics a more friendly science. Production of antibodies from B lymphocytes still appears as a rocket science (!). It is not as easy as purchasing the chemical active ingredient from a API supplier, sourcing the excipients and punching it all into a marketable form like a tablet (with the help of a BMR (Batch Manufacturing Record), which is also a purchasable item today). The science and experience for handling production of antibodies from B lymphocytes is still in the preserve of a few companies. A-Bio in Singapore, AbD Serotech, Adar Biotech, Aeres, Affinity Life Sciences, Agri Bio, Alpha Biologics etc. These companies produce: 1 g to 10 g quantities of the antibody. Big factories produce upto 10 kg of the antibody. k) Humanization techniques are used to make antibodies "human friendly" so that the human immune system accepts them. The above major steps is very simplistic sequence of the MAB commercial production science. There are many things involved here: fermentors and other equipment, enzymes and other chemicals, humidity and temperature control, techniques and procedures, valuable experience and many other small "trade secrets" that companies hold near and dear to them! If only one antibody is desired then above process is applicable; the selected B lymphocytes and hybridomas will produce only one type of antibody. If the antibodies are produced from a single clone of cells: they are called MABs or monoclonal antibodies. When antibodies are produced from several different clones (duplicates) of B lymphocytes they are called polyclonal antibodies. To ensure India gains, biosimilar manufacturing and marketing expertise (just as we have it for chemical based pharma formulations), the drive at Govt. and NGO level ought to be to give hands-on experiences to do various parts of the MAB (monoclonal antibody) science. For eg., growing hybridomas, fusing B lymphocytes with myelomas, selection of right hybridomas, lectures on HAT medium and its uses etc. When people learn by doing, talking, listening and teaching about it all, India will be the gainer and we can make a mark in the world with MAB business too! Not just individuals, organizations need to have this PREPARATION MEETS OPPORTUNITY mindset. It necessarily means having a knowledge rich immersive internal environment in the company, constant learning engagements in the firm and continuous opportunity spotting strategies for having the right preparation strategies. Biocon could enter MAB business, through this preparation-mindset. Individuals too need to have a preparation-mindset so that opportunities can be used. Training is not just about creating learning experiences for skill and knowledge development. Today, it is about creating and actualizing the preparation-mindset. Making trainees hungry for change and knowledge, making trainees hungry for preparing for a bigger challenge. 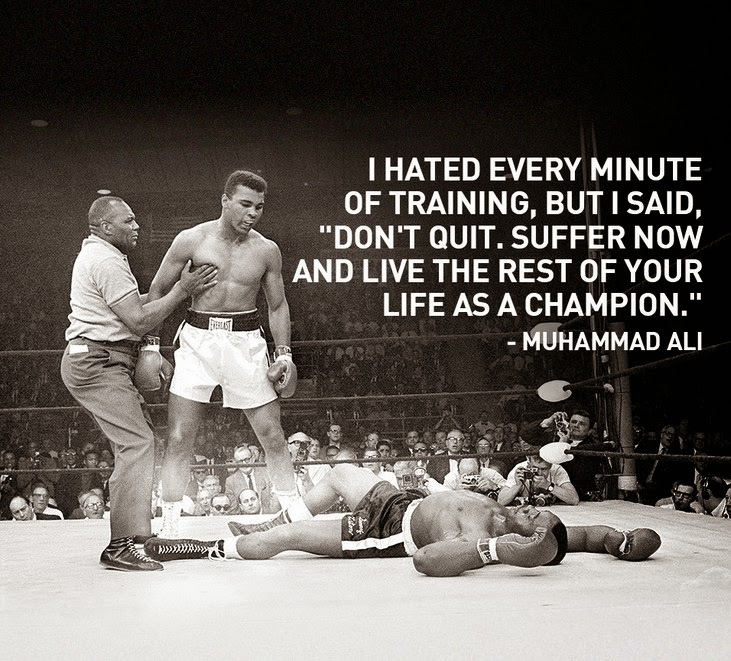 That is about preparation through training. I thank you for reading this blogpost. I also dedicate this blogpost to Ms. Le Trang M Pharm (Paris) of Hanoi, Vietnam, discussions with whom triggered this 'preparation meets opportunity' concept. Please do scroll down and read all other posts (click on older posts when required), kindly recommend this blog to your acquaintances. The information which you have provided is very good. It is very useful who is looking for Health Care Products. Now the time to give rate point about your Nursing colleges,pharmacy institute and make it Best Nursing Colleges in india,Best Pharmacy Institutes in india that it deserve.